Craig Brown CBE After dinner and Motivational speaker is a former Scotland Football Team Manager. Craig Brown was appointed as manager of Scotland in December 1993, having been caretaker manager, with responsibility for games against Italy and Malta, due to Andy Roxburgh’s resignation. Craig has an outstanding record as Scotland Team a. He took the team to Euro 96 and France 98, and beat England in the last ever Euro Championship qualifier at Wembley in 1999 by one goal to nil. He later resigned as team manager in 2001. Craig played for Scottish schools, youth and junior International teams, before joining Rangers in 1959, aged just 19.In 1962 he moved to Dundee F.C., where he won a League Championship medal. Brown stayed at Dundee for six years, before signing for Falkirk in 1967. 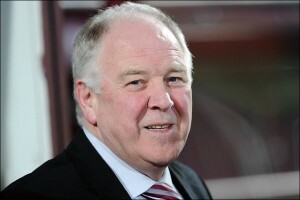 Having shown an interest in coaching, Craig became assistant manager of Motherwell in 1974. He got his first managerial job as part-time manager of Clyde in 1977, where he spent ten seasons, winning the Second Division championship in 1982 – whilst also working as a primary school head teacher. Craig Brown was awarded the CBE in the Queen’s Birthday Honours in 1999. In 2002 he was appointed manager of Preston North End but left by mutual consent in 2004 after 106 games. In the summer of 2005 Craig joined Fulham F.C. as the Club’s new International Representative. In 2009, Craig was appointed manager of Motherwell F.C. and in 2010 moved onto Aberdeen. Craig has a Bachelor of Arts Degree and Diploma in Physical Education. Prior to full-time football involvement Craig was Head Teacher, then Lecturer in Primary Education. Brown is an Honorary Lecturer in the Department of Economics and Management of Paisley University and is the author of “Activity Methods in the Middle Years” (Oliver & Boyd, 1975). Craig is Scotland’s second most successful manager of all time. He is a Bachelor of Arts in English and Geography and the co-author of a well recognised text book on Primary Teaching Methods. Craig Brown is a keen golfer, and a superb motivational or after-dinner speaker.